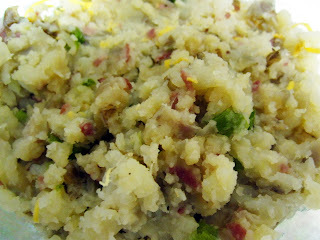 This side dish is a great way to finish off extra mashed potatoes make mashed potatoes. If you already have mashed potatoes, simply add in the extra flavors, mix well, and serve. These mashed potatoes made me think of potato skins since they share a lot of the same fillings/flavors. With the Super Bowl coming up, these could be a filling for potato skins or just served on their own anytime! Just adding a few ingredients to your basic mashed potatoes makes a huge difference, and in this case, transforms something typical to something that's very flavorful in under 10 minutes! What's your favorite way to make and/or eat mashed potatoes? If starting from raw potatoes, wrap potatoes in aluminum foil (make a pouch) and add some water before sealing the foil, and then bake at 375F until soft. Once potatoes are ready, mash them. Cook onions, green peppers, and bacon until onions are translucent. Combine with mashed potatoes and cheese. Sprinkle additional cheese on top, if desired, and bake until cheese melted.